Osteoarthritis is a common problem for many people after middle age. Osteoarthritis is sometimes referred to as degenerative, or wear and tear arthritis. The main problem in osteoarthritis is degenerative of the articular cartilage that covers the joint. This results in areas of the joint where bone rubs against bone. Bone spurs may form around the joint as the body’s response. How does Osteoarthritis Knee occur? Osteoarthritis may result from an injury to the knee earlier in life. Fractures involving the joint surfaces, instability from ligament tears, and meniscal injuries can all cause abnormal wear and tear of the knee joint. Not all cases of osteoarthritis are related to prior injury. Other causes include over weight and lack of exercise. Research has shown that some people are prone to develop osteoarthritis, and this tendency may be genetic. What does Osteoarthritis Knee feel like? Osteoarthritis develops slowly over several years. 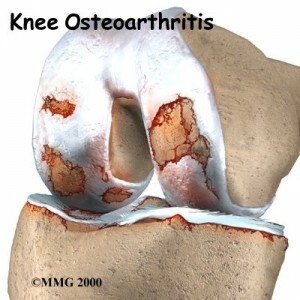 The symptoms of osteoarthritis are mainly pain, swelling, and stiffening of the knee. The pain of osteoarthritis is usually worse after activity. Early in the course of the disease, you may notice that your knee does fairly well while walking, then after sitting for several minutes the knee becomes stiff and painful. As the condition progresses, pain can interfere with even simple daily activities. In the late stages, the pain can be continuous and even affect sleep patterns. How do we know we have this osteoarthritis? The diagnosis of osteoarthritis can usually be made on the basis of the initial history and examination. X-Rays are very helpful in the diagnosis and may be the only special test required in the majority of cases. 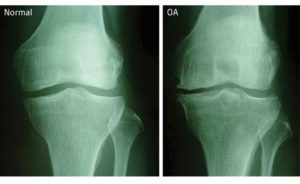 In some cases of early osteoarthritis, the X-rays may not show changes typical of osteoarthritis. If the diagnosis is still unclear, arthroscopy may be necessary to actually look inside the knee and see if the joint surfaces are beginning to develop changes from wear and tear. Arthroscopy is a surgical procedure where a small fibre optic television camera is inserted into the knee joint through a very small incision, about a 5mm. The surgeon can then move the camera around inside the joint while watching the pictures on a TV screen. The structures inside the joint can be poked and pulled with small surgical instruments to see if there is any damage. What can be done for your knee pain? Our first goal, then, will be to help reduce pain in the knee. Your doctor may prescribe drugs such as Vioxx or Arcoxia, as an excellent reliever in pain and inflammation. They are very safe and effective. Recently, a new type of injectable medication has become available in the US. Hyaluronic acid preparations have been used in Europe and Canada for several years and seem to be beneficial in decreasing the symptoms in knees that have mild to moderate osteoarthritis changes. The medication requires 3 to 5 injections given over a one-month period. The medication seems to reduce symptoms in many patients for 6-8 months. Sources of heat, like a moist hot pack, ultrasound, or diathermy, can help reduce discomfort by stimulating blood flow and overriding pain sensation. Joint mobilization maybe chosen for its ability to provide nutrition and lubrication to the joint surfaces. It is also helpful for overriding the transmission of pain to the brain. Another helpful treatment to reduce pain is transcutaneous nerve stimulation (TENS for short), which uses a mild electrical impulse to block pain. Certain topical ointments (such as Capsaicin) can also help limit pain. Increase strength: In the early stages, strengthening may be done using isometric exercise. These are exercises in which the muscles contract, but the joint stays in one position. Isometrics help restore strength while protecting you from further pain and irritation. As your muscles gain strength, you may notice less pain in the knee while feeling a sense of ease with walking and doing general activities. Arthroscopy is sometimes useful in the treatment of osteoarthritis of the knee. Looking directly at the articular cartilage surfaces of the knee is the most accurate way of determining how advanced the osteo arthritis. Arthroscopy also allows the surgeon to debride the knee joint. Debridement essentially consists of cleaning out the joint of all debris and loose fragments. During the debridement any loose fragments of cartilage are removed and the knee is washed with a saline (salt) solution. The areas of the knee joint, which are badly worn, may be roughened with a burr to promote the growth of new cartilage – a fibrocartilage material that is similar scar tissue. Debridement of the knee using the arthroscope is not 100% successful. If successful, it usually affords temporary relief of symptoms for somewhere between 6 months – 2 years. Osteoarthritis usually affects the inside half (medial compartment)of the knee more often than the outside (lateral compartment). This can lead to the lower extremity becoming slightly bowlegged. The procedure to re-align the angles of the lower extremity is called a Proximal Tibial Osteotomy. In this procedure a wedge of bone is removed from the lateral side of the upper tibia. The ultimate solution for osteoarthritis of the knee is to replace the joint surfaces with an artificial knee joint. The decision to proceed with a total knee replacement is usually only considered in people over the age of 60, (although younger patients sometimes require the surgery simply because no other acceptable solution is available to treat their condition). The main reason that orthopaedic surgeons are reluctant to perform the surgery on younger individuals, is that the younger the patient, the more likely the artificial joint will fail during the patient’s lifetime. Replacing the knee again, a process called a revision, is much harder, has more potential complications and is less likely to be successful. Artificial knee joints last about 12 years in an elderly population. Younger patients are more active and place more stress on the artificial joint. This can lead to loosening and failure of the artificial knee earlier after surgery. Obviously, younger patients are also more likely to outlive their artificial joint, and will almost surely require a revision at some point down the road. It is for these reasons that orthopaedic surgeons are usually reluctant to recommend a total knee replacement in the younger patient until there are simply no other options. Visit the Singapore Sports Clinic with Dr. Kevin Yip for more information about knee pain and its treatment or call us at (65) 6476 2106 to get your knee checked. Osteoarthritis: Why Do You Need To Consider Joint Replacement Surgery?